Hmm. Maybe a little too much Joseph Conrad. Anyway, moving on. So, I fell absolutely in love with TERA for a couple of months, and now we’re going through a rocky breakup. This sort of thing happens. I still can’t say enough good things about the first, oh, 55 levels of my TERA career. The story quests were engaging, I was loving my jaunts into dungeons, I felt like I was getting progressively more and more badass as I got new skills and new gear, and in general I was loving running around as a cute bunny girl with a massive axe. After 55, though, things started kind of declining. I was still loving the combat, but it was starting to take longer and longer to fill up the experience bar. Quests were rewarding less and less experience proportional to the amount of experience needed to level, and the stuff that I was having to kill for them had turned into massive bags of hit points that needed to be slowly whittled down. It got worse at level 58 or so. The dungeons available in your late late 50s are pretty tough. They have to be, really, because you can have level 60 players in your group, but it also means that people get discouraged a lot. Discouraged players leave, and all of a sudden you’re looking at having wasted a couple of hours with no real progress made. I stopped doing dungeons and focused on questing and grinding my way up. I’d gotten to level cap in much tougher MMOs, after all, so I knew that I had the patience for it. Eventually I hit level 60 and rewarded myself by hitting up the auction house for a new outfit. There’s not a lot to spend money on in Tera as you’re leveling, so I had about 3 grand in the bank. As a result, I managed to put together a full suit of really high-end armor at the cost of about half of my available funds. This is where I suddenly had a vision of the future, and it wasn’t a good vision. 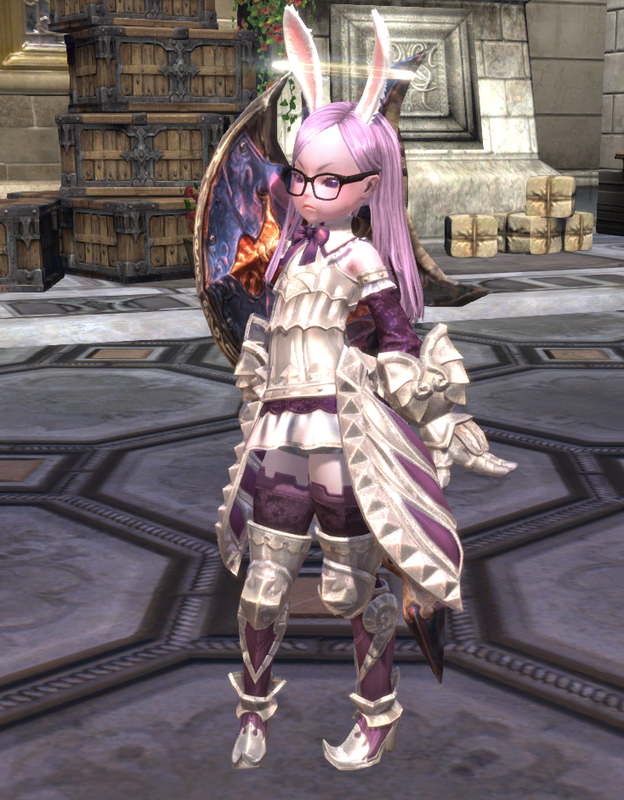 See, the best armor in Tera is all enchantable, which means that it’s OK when you get it, but you can make it REALLY good through a process which involves sacrificing one piece of gear for the chance at making another piece of gear better. This, then, is the reason to run dungeons once you’re at the level cap. It’s not getting better gear, because you can afford great gear off the auction house for, basically, peanuts. Rather, you are running dungeons for the chance that gear will drop that you can melt down for the slim chance of making what you’re already wearing marginally better. Compare this to your traditional MMO. When you run a dungeon in one of those and an Awesome Plate Breastplate Of Ultimate Tankage drops, you get to cheer for the tank who gets to loot it because you know that he has just gotten a new piece of gear that will make him a Better Tank so your group can take on bigger and nastier challenges. This is the sort of thing that has made Blizzard and Sony Online Entertainment about a gazillion dollars over the last decade and a half. I tried to put a good face on things at this point. I took all the spare gear in my bags and bank, and then spent a few hundred more on the auction house to buy some more stuff, and I threw all of it at my shiny new armor and prayed for it to stick, and I actually had pretty decent luck with the enchanting lottery. I wound up with all of my stuff enchanted up to +5 and still had money left over. And that’s where I logged off. I am kitted out to the point where I can credibly walk into any dungeon in the game and have a good shot at pulling through it, but I can’t muster up the enthusiasm to actually DO it. I do, however, look awesome. So, to sum up my two months of Tera: AMAZING for the first 55 levels. There’s a ton of stuff in the game that I hope other companies steal for their own MMOs, particularly the combat and character customization options, and the localization team deserves particular acclaim for making some of the quests genuinely funny. I firmly believe that it’s a game that anyone who likes MMOs should experience for themselves. Just brace yourself for the heartbreak at the end. This entry was posted in MMORPG, PC Gaming, Tera. Bookmark the permalink. 1 Response to The TERA! The TERA!